Todwong addresses NRM leaders in Upper Madi. MADI. 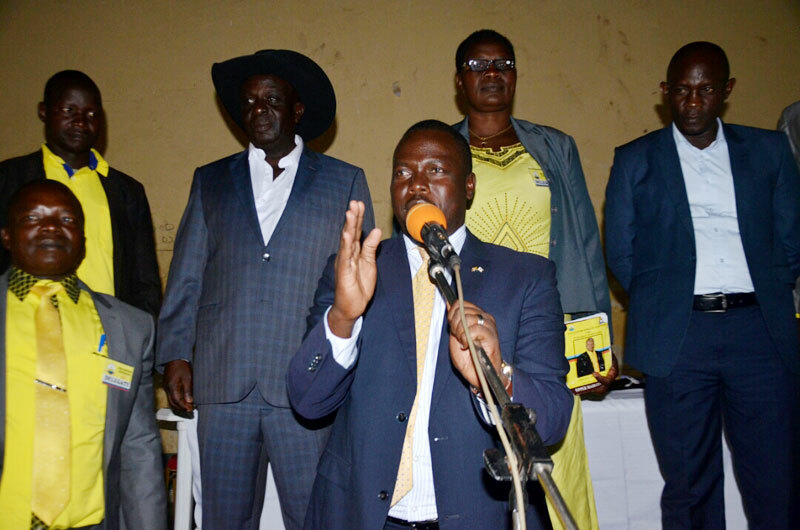 NRM Deputy Secretary General Richard Todwong has warned the people of upper Madi Constituency in Arua District against any acts of violence during and after the forthcoming by-elections. Todwong who was addressing NRM district delegates at Okollo Community Centre yesterday, challenged the Madi party leaders to remain exemplary to others throughout the electoral process. Todwong’s warning follows intelligence reports that some rival aspirants were planning to mobilise the youth to disrupt the campaigns. He reminded his audience that the NRM government was well facilitated to protect its people against any forms of violence. “If the NRM government can control and protect the whole country, what about the 113 villages of Upper Madi?” Todwong asked. Todwong said the Government commitment to deliver Uganda into a middle income status by 2020 was an obligation rather than a mere promise. Etuka is the NRM flag bearer for Upper Madi constituency. Campaigning for the NRM flag bearer in the by-election, Isaac Etuka, Todwong rebuffed allegations that he wasn’t eligible to seek re-election due to lack of relevant academic papers. He said Etuka’s papers had been verified by relevant authorities and found to be satisfactory. Todwong urged members to put aside any differences and rally their support behind Etuka. President Museveni, who is also the NRM chairman, is expected to travel to Upper Madi later in June to canvas support for Etuka. Etuka beat five others to the Upper Madi constituency seat in the February 2016 election. However, court later nullified his election on grounds that the NRM candidate did not have minimum academic documents to qualify to be an MP. Etuka has since verified his academic papers with relevant agencies. Nominations by the Independent National Electoral Commission for the by-election was due to take place today.